The sports world lost two giants this year, both of them leaving legacies far beyond the world of sport. 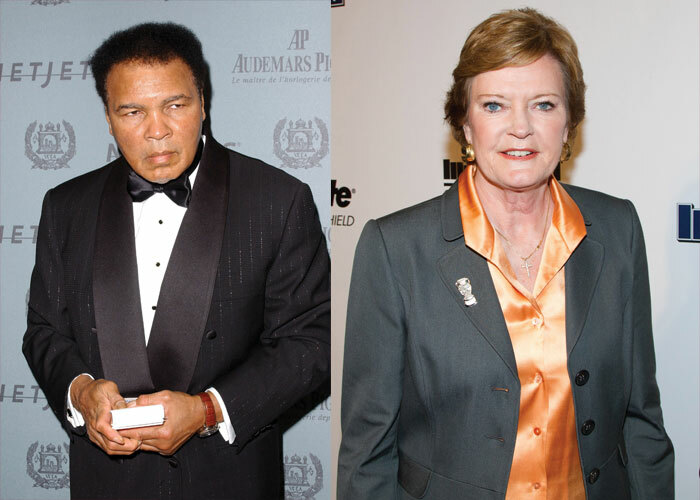 Muhammad Ali died on June 3 at age 74 after a 32-year battle with Parkinson’s disease, and Pat Summitt died on June 28 at age 64 after a five-year battle with early-onset dementia. These two Medal of Freedom winners will long be remembered! Muhammad Ali was “The Greatest” in the boxing ring as a three-time World Heavyweight Champion but he was also great in the way he lived his life, never walking away from controversy. Born Cassius Marcellus Clay Jr., he started boxing at 12, winning Golden Gloves titles. In 1960 he represented the U.S. at the Olympics in Rome where he won a gold medal fighting as a light heavyweight and shortly thereafter, turned professional. Following his boxing career, Ali took on a humanitarian role, traveling the globe and sponsoring many philanthropic causes. President George W. Bush honored him with the Presidential Medal of Freedom in 2005. The Muhammad Ali Center in Louisville acts as a forum for promoting tolerance and respect as well as honoring his life. Living in Arizona for the last part of his life with his wife, Yolanda “Lonnie” Williams, in 1997 the Muhammad Ali Parkinson Center domiciled at St. Joseph’s Hospital and Medical Center in Phoenix was opened. He supported it and many other charities over the years with large fundraisers. Ali will long be remembered not only as a supreme athlete but also as a courageous, compassionate and generous human being. Pat Summitt is still the winningest coach in NCAA history, and that includes both women’s and men’s teams in any division. From her start in 1974, her teams won eight NCAA national championships, second only to legendary UCLA men’s coach John Wooden’s 10 championships. In fact, in her 38 years with the University of Tennessee Lady Vols, Summitt never had a losing season – just one of the reasons that her amazing list of awards includes being named the Naismith Basketball Coach of the Century in 2000 and appearing as number 11 on the Sporting News list of the 50 Greatest Coaches of All Time in all sports in 2009; the only woman to make the list. Diagnosed with early-onset dementia, Summitt retired in August 2011. For her courage in going public, President Barak Obama awarded her the Presidential Medal of Freedom. She also received the Billy Jean King Legacy Award from the U.S. Tennis Association and the Arthur Ashe Courage Award at the 2012 ESPY Awards. A Compete quiz once asked: “What do the Central Intelligence Agency, Victoria’s Secret, Federal Express and the Federal Reserve Board all have in common?” The answer is Pat Summitt. Understanding that her value and worth transcended basketball, these four very different agencies and businesses all hired her as a motivational speaker. Miriam Latto has been a Compete Magazine contributing writer since 2013.